(This page) 6. Flute restoration: "before" and "after"
overhauled, and repaired (with a replacement Eppler headjoint). This project, like all old wooden flute restorations, is essentially the struggle to bring an old instrument, however well made for its time, to the highest possible standards expected of today's professional flutes--always a very long distance, in my extensive experience. This standard is by no means easily achieved in contemporary flutes made of metal, much less in venerable old flutes made of wood. 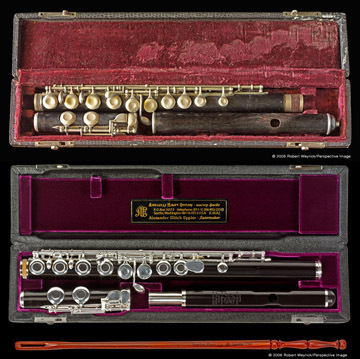 For the record, despite the appearance and terrible condition of the "old" flute, it was very well designed and executed by its original maker; a bow and glory to him. So it is good to bear in mind that, although there are many flutes that look a great deal more appealing than this one as candidates for restoration, this flute represents one of the less difficult restoration projects that I have recently undertaken. To begin with, it was neccessary to replace the old headjoint with a new Eppler wooden headjoint, custom designed for this project. The new, modern "artist" headjoint led to a great "night and day" improvement in the playing quality of the instrument, increasing volume, stabilizing intonation, and allowing freer playing throughout its range. This headjoint was made from aged, 40-year-old African blackwood (grenadilla) carefully selected to match the old wood of the original flute, and sterling silver. The new headjoint was designed to be compatible with a wide variety of modern wooden as well as metal flutes. To accommodate the modern headjoint design, the headjoint tenon socket arrangement of the body had to be redesigned and the body had to be modified by adding "grafting" on a grenadilla and silver extension. The place where the new is connected to the old includes the employment of miniature grenadilla pins and other innovations resulting in a joint that is almost invisible to the unaided eye and is actually stronger than the original wood of the body joint. Complete mechanical overhaul of the flute mechanism to a "better than new" standard followed. This is absolutely neccessary, as we use Straubinger flute pads exclusively throughout (including trills and upper C#), a class of flute pad that demands mechanical perfection. Much of the mechanism was bent or binding and needed to be straightened (all of the key cups had to be straightened--even the trills, and centered exactly over the toneholes). The German silver mechanism was deeply etched from the efforts of previous craftsmen. It was extremely difficult to polish out completely because the metal had been previously ground away in many places to a thickness of only 0.25 mm (0.010") and had many deep scratches. The lower portion of the body rib had been badly bent, with the wood screws torn out, and required repair. Several extensions to the hinge tubing had to be silver soldered on and numerous repairs made to compromised or failed old solder joints. The mechanism was adjusted to allow for modern venting of the tone holes so that the keys could open an additional 1 to 1.5 mm more. (Plateau flutes must have slightly more venting than French-open hole flutes.) Complete re-springing was also undertaken, as the flute still had the original needle springs that were rusted, either much too thick, giving a terribly stiff action, or smaller than today's standard, leaving the feeling of a sluggish and underpowered mechanism. Consequently, spring tension was reduced by 50 - 75% throughout, which nevertheless resulted in a much livelier, supple and even key action. The old system of threaded pillar and washer pad retainers needed to be cut out and replaced with all new pad screws, washers and spuds. Replacements had to be made for several of the steels (long screws), missing wood screws, and broken or stripped adjusting screws (you can see the holes for the missing screws in the lower left of the "old" view photograph; the "new" view shows clearly the replaced screws). A new silver C# roller was made to replace the old rubber one, as well as a new ergonomic silver upper C# button-spatula (requested by the customer.) The entire mechanism was double silver plated, including footjoint rings and the body footjoint tenon rings. (Double silver plating gives better wear as well as making all the key posts and hinge tubing snug, eliminating the need to go to larger diameter steels.) All key posts, hinge tubing, spring holes, etc., had to be carefully reamed back up to size and all screw threads after plating had to be re-cut. The bore at the end of the footjoint was given a radius to improve the response of low C. All toneholes are carefully undercut (using mirrors), the pad seats are trued to a tolerance of 0.005 mm (0.0002") and lightly chamfered and polished. The wooden body and footjoint were carefully trued and polished (bores included). We employ a proprietary method of sealing and stabilizing wooden flutes. This is not a finish that results in a visible coating left on the surface; rather, this treatment, upon completion, yields a bare, highly polished, and stable wood surface. Depending on the species and condition of the wood being treated, this procedure can take anywhere from one to six weeks. The process employed integrates with the cellular structure of the wood, in no way affecting tone quality, but greatly strengthening it, "hardening" it against changes in climate and humidity, helping raise the wood's resistance to these conditions. This process leads directly to the unrivaled, extraordinary stability, in all climates, of our wooden flutes, headjoints and wooden flute restorations. It also has an interesting mechanical effect in strengthening the screw threads cut into the wood for the wood screws that unite the silver mechanism to the wooden body. We use Straubinger pads to the exclusion of all others because of their proven superiority over any other type of pad. (I have always tried to raise, when appropriate, the standards of our clientele.) These pads acoustically affect the flute by increasing clarity and volume. The unrivalled stability and precision of Straubinger pads (it is possible through their use to easily increase accuracy of 2 to 4 times that of flutes using traditional pads) and their extraordinary stability has allowed us to ship a great variety of flutes wordwide, going on two decades, without problems. (The rarity of problems, is in itself, amazing.) No paper shims (washers) are used in padding because of their inherent instability. Only precision, plastic tool and die shim stock is used, with the thinnest shim measuring only 0.012 mm (0.0005") in thickness. We are able to eliminate over 90% of the mechanical noise of the flute through special silencing. Special, artificial felt is used instead of cork (with the exception of the D# spatula.) All padding is rendered "airtight" through the use of special tools, supplies and techniques. A new case and swab were specially made. Note the superior support provided in the case--the extra wide pillows and saddles, the extra foot to support the footjoint on the lid. The swab is made of rosewood (which is softer than grenadilla wood and hence will not scratch the wood in the flute.) The stick, despite its attractive appearance, is of ergonomic design, meant to fit the thumb and ball of the hand holding it, and for convenience of use, is somewhat longer than standard swabs. We also provided a custom sewn, heavily padded Cavallaro case cover with zippered pocket (for the swab, visiting cards, etc. ), sewn carrying handle and detachable arm sling. Addition of C# trill keys.